Today on the Doc On The Run Podcast we’re talking about the five worst exercises you can do when you have a plantar plate sprain. Since we published the series of podcasts explaining the different conditions that can affect the ball of the foot we have had a lot of questions about plantar plate sprains. This episode should answer some of those questions. One of the very first recommendations from most doctors when you have a sprain of the plantar plate is to stop running. If you have listened to many of my other episodes you probably know that I’m not a fan of that approach. I also put my money where my mouth is. In fact just about a week ago I got a minor sprain on my own plantar plate. Yesterday, I went for a trail run on the Dipsea Trail. Today I went for a bike ride. I have no intentions of completely stopping exercise while this thing heals. But I’ll bet the ranch that I can get it to heal. Now in defense of all the doctors who reflexively to tell you to stop running when you get a plantar plate tear, or even a very minor sprain, their intentions are good. They don’t want you to get any worse. The very first step in healing a plantar plate sprain is to make sure that you don’t make the condition worse. Because it’s a tiny little ligament and it’s easy to make it worse! In many cases you can continue to run and still heal a sprain of the plantar plate. But this depends on many different factors. However, there are some exercises which I believe are much more stressful than running when it comes to the stresses applied to the plantar plate. If you do these exercises you can rest assured that a tear in the plantar plate is going to continue to get worse. So without further ado here are the top five worst exercises for a plantar plate tear. Lunges are a mainstay of strength training for runners. Lunges are one of the best ways to strengthen your legs and obviously you need strong legs if you want to run fast. Incorporating lunges into your strength training routine can help engage your glutes, hip flexors, quadriceps hamstrings calves and your core, namely the abdominal muscles. That extra muscle recruitment can make you faster. But lunges can do a number on the plantar plate. If you’re doing lunges correctly, as you extend that leg behind you, the toes are maximally dorsiflex. The toes are approaching a 90° angle to the top of the foot. This position of the foot applies the absolute maximum amount of torque at the metatarsophalangeal joints at the base of the toes, and consequently places the maximum strain on the plantar plate ligament. If your goal is to get stronger quadriceps and hip flexors, lunges are great. But if your goal is to heal the plantar plate, you should stay off the lunges until the pain and fullness in the ball of the foot completely dissipates. One day when I was training for an Ironman, I was on a bike ride heading up Mount Tam. Up ahead, as I rounded a curve I saw a guy running. Uphill. As I approached, I saw the unmistakably ripped calves that could only belong to Dean Karnazes. And sure enough, as I got closer I realized it was him. This is a hard bike ride so I cannot imagine what it would be like to run it. But that’s why Dean has those calves. It seems like strong, well-defined calves just have to make you run faster. And that’s part of the reason so many runners do calf raises. Unless you run up mountains Like Dean, it’s not really that easy to build strong calves. However, if you go to the gym, pick up a couple of dumbbells and start doing calf raises, you will get some pretty wicked calf muscles pretty quick. The problem with the plantar plate is that when you stand up on your toes you have the maximum amount of force right on the plantar plate ligament. You may not be dorsiflexing your toes quite as much as when you are doing lunges, but that very slight advantage is well offset by the fact that you are standing up on your toes, teetering slightly as you balance on your tippy toes while holding those weights. Basically, you’re just grinding away at the plantar plate when you are at the end of the up cycle, standing on your toes. You don’t have to know a lot about biomechanics to understand that this cannot possibly be a good thing for that tiny little ligament. So if you suspect you have pain in the ball of the foot caused by a sprain in the plantar plate, give it a break and stay away from the calf raises until it calms down. When elliptical trainers came out they seemed to become an overnight sensation with orthopedic surgeons. The perfect panacea for the exercise addict who is at risk of wearing out their knees. The great thing about the elliptical trainer is that it’s very low impact. You don’t have any of the pounding and jarring of running. Not that you as a runner necessarily cares about that so much, but many orthopedic surgeon seem to believe that when you run you’re beating yourself up unnecessarily. But that’s another episode. The problem with the elliptical trainer is that for many, if not most elliptical trainers, your toes end up in a position that is sort of a cross between calf raises and lunges. It’s kind of the worst of both worlds. Every single backstroke, your heel is coming up off of the plate and placing all that force right on the plantar plate. Just to drive home the point, I went for a trail run yesterday ago with a mild sprain my plantar plate. But I would definitely not get on an elliptical trainer with a plantar plate sprain. Although I don’t have any real data to support it, anecdotally, it seems like I see an awful lot of athletes who develop plantar plate sprains who do several workouts per week on an elliptical trainer. If you want to develop explosive strength quickly, start doing CrossFit. I have nothing against CrossFit at all. But there are couple of CrossFit exercises that can really do a number on the plantar plate when it is injured. 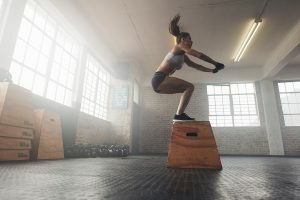 The worst offender is probably box jumps. Depending upon your form, you may extend into a full calf raise at the moment of takeoff. Then you land flat-footed on top of the box. That part is not really a big deal. However, when you step back down or, if you jump down, you’re really putting a tremendous strain on the plantar plate. Many athletes don’t even realize they’re doing this because the hard/ strenuous part is exploding up onto that box. They don’t realize that the real stress and strain with this particular plantar plate injury is really when you’re stepping down off of the boxing getting ready to do their next jump. If you think about the previous exercises we are discussing, you can see how a box jump can really batter the plantar plate ligament. I love running stairs. I don’t do hill repeats because I think hill repeats are just too risky in terms of developing an over training injury. But I do love running stairs and sometimes I just can’t help myself. In fact the Dipsea Trail, where I did my trail yesterday has lots of stairs. So before you accuse me of speaking heresy I will say that I was pretty easy on my left foot when I was doing the stairs. And the stairs are just interspersed here and there throughout the trail run. I also was wearing shoes that I knew would take some of the stress and strain off the plantar plate. And I was leading with my right foot and taking shorter steps with my left. So I was making a special effort to protect that gimpy plantar plate. 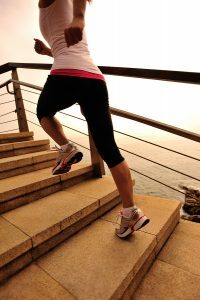 But the truth is, running stairs, really running stairs, like going to a stadium or an office building and then running up flight after flight, is really asking for trouble. Have you ever run stairs? I mean seriously, it takes you what maybe about a minute before you’re completely hammered. You’re out of breath and your quads are about to explode. And at that point you just getting started. Your quads are on fire, you know you’re getting stronger, but your form is terrible. You are wobbly and unstable, so all the time you’re running up those stairs you’re delivering more and more unpredictable forces throughout the ball of the foot. And that’s part of the reason why running stairs is such a terrible idea when you have a true plantar plate sprain. Not only does pushing off and launching yourself upward toward the next step put a lot of stress on the ball of the foot, you wind up doing so with relatively poor form. As we talked about many times before, poor form leads to higher forces concentrated on structures in an unpredictable way. So again part of the big key with getting a plantar plate sprain to calm down quickly is to just not make it worse. Would my plantar plate sprain calm down faster if I didn’t run on the Dipsea Trail? Probably. But I like running on the Dipsea Trail. It’s unbelievably beautiful and it’s fun! And I was careful. The main point here is it you don’t necessarily have to give up running to get a plantar plate injury to heal. It all depends upon the severity of the condition and the amount of effort you’re willing to put into modifying activities so you can keep running. If you wear the right shoes and it’s relatively mild then maybe you could run on the Dipsea Trail as well. Regardless of the type of running injury afflicting you, it’s critical that you evaluate the highest force activities. Cut those out first. Let’s face it, if you can run on flat ground, that’s better than not running it all. And if you can keep running on flat ground because you cut out the calf raises, lunges and elliptical sessions, wouldn’t seem like a win? So if you go see your doctor and your doctor says you have a plantar plate sprain, prepare to dig your heels in. Without making yourself look like an idiot or an exercise fanatic, you need to find a way to drive home the point to your doctor that it’s really important to you that you continue to run. Start that discussion by making some compromises. Explain you are willing to give up some activities like basketball, tennis, calf raises or whatever you don’t really want to do, if she will just help you figure out what it will take to decrease the forces throughout the ball the foot so you can continue to run. It is your doctor’s job to help you figure out how to heal so you can continue to run. It’s your job to make your doctor understand how important that is to you.